Remich, which was known as ‘Remacum’ during ancient times, used to be popular with fishers and boatsmen. Over the last few centuries, the village was conquered and destroyed several times which triggered the construction of its fortress. The latter’s remains are still visible to this date. Today, Remich is a small tourist village on the European Road between Sarrebruck and Luxembourg. Here, one finds oneself in a romantic environment of vineyards and dense green spaces, which enclose the village of Remich like an amphitheatre, whose stage is the Moselle River. Along the river, one can walk a 3km long promenade of birch and cherry trees while observing the passing boats, ships and various water sports activities. The famous Bacchus fountain, designed by the Luxembourgish artist Will Lofy, offers cooling during the warmer days and even a celebration is dedicated to the fountain every year during the summer period. Feel free to explore Remich through its charming old alleys and its historically important remains. Through the St Nicolas gate, built in honour of the fishers and boatmen’s patron, one enters St Cunibert street which is home to this religious man’s birth place who was also the archbishop of Cologne in the seventh century. 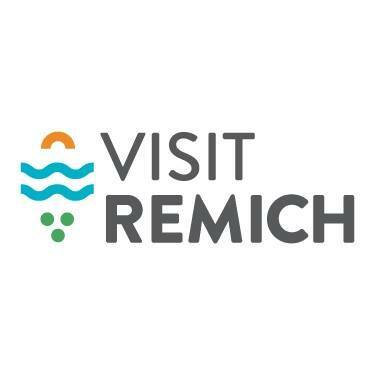 The next stop on your tour represents the heart of Remich with its pedestrian zone, small squares, fountains, and narrow alleys. The tower of Remich’s parish church, which forms part of the country’s cultural heritage, offers a panoramic view of the village as well as the Park Brill with its pond, its children’s playground, a stage and the tennis courts. On the Moselle River, several tourist ships offer boat cruises, which allow the visitor to experience the border triangle from the river. A few metres down along the river, the tourist office as well as the bike rental service ‘Rent-a-Bike’, a children’s playground and one of the Greater Region’s largest Mini-Golf courses can be found. Following this direction, Remich’s outdoor swimming pool offers a heated pool and Olympic swimming distances. Four further indoor swimming pools as well as the renowned thermal baths in Mondorf-les-Bains can be found in a 20km perimeter from Remich. Furthermore, sports enthusiasts benefit from a bike trail, which runs along the Moselle River, or a fitness trail through the surrounding forests. In a 10km perimeter from Remich, two casinos, namely the ‘Casino 2000’ in Mondorf-les-Bains and the ‘Casino Schloss Berg’ in Nennig on the other side of the river in Germany can be found. Over the summer period, the village of Remich organizes local festivities and barbecues on a regular basis. Remich is home to a lively variety of hotels and restaurants with beautiful terraces and international highlights. Because of its perfect location in the boarder triangle, Luxembourg’s capital city can be reached in less than 40 minutes while the neighbouring cities of Trier, Saarburg, Sierck and other culturally interesting cities are also worth a visit. Not only does Remich offer a perfect starting point for your trips, but it is also the heart of Luxembourg’s wine culture. Besides the Vini-Viticole institute, a variety of wineries, out of which one is underground, can be found. The wineries in Remich’s neighbouring villages offer tastings of the countries’ renowned wines, which have gained international recognition over and over again. It is to all these highlights that Remich owes its recognition as the Pearl of the Moselle.